Lack of ferry safety is a problem in many parts of the world where ferry travel is not discretionary and accounts for loss of lives and limits economic development and consequently sustainability. Since 2005, Interferry and the International Maritime Organization (IMO) have been seeking to address this problem, working with Bangladesh and other developing nations/emerging markets. In Bangladesh, the Ferry Safety Working Group sought and tested a training course designed for crews. This open source course is now freely available upon registration by request to ferrysafety@gmail.com. IMO also led the planning and implementation of two Ferry Safety Information Sharing Forums in Indonesia, the Pacific Region, and China, with a forum proposed for Africa. 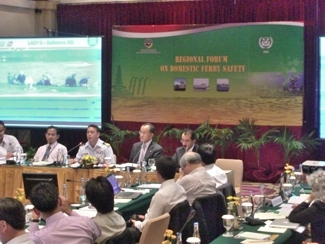 As a result of the experience in Bangladesh and with the information sharing forums the Worldwide Ferry Safety Association has decided to focus its efforts on spurring design, and construction, of safe affordable ferries through an international student competition; distribution and use of an effective training program; and commissioning research by students on topics for which information is needed to improve effectiveness of our efforts.